Hauskaa lauantaita, tervetuloa Allsorts haasteen pariin! Metsän eläimet - ovat viikon aiheena. Malliksi tein jouluisia kettukortteja! Hi; Happy Saturday, it's time for a new Allsorts Challenge! "Forest Friends" is the theme for this week. I made three Christmas cards with fox stamp. A great combination of dies and stamping Mervi and your Fox is lovely - he looks a little more friendly than mine. Voi miten ihanan hassu kettu! sweet design, luv your coloring! I am so glad you played along with us at simon says stamp wednesday challenge! 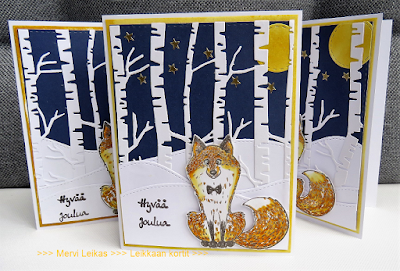 Superb creation, gorgeous background and love the little fox and the way you have cut him out. What a delightful little fox, Mervi, and wonderful background trees. Great coloring on the fox! It's great to see you playing along with us at Emerald City Crafts this month. Good luck in the challenge and come see us again for another challenge. 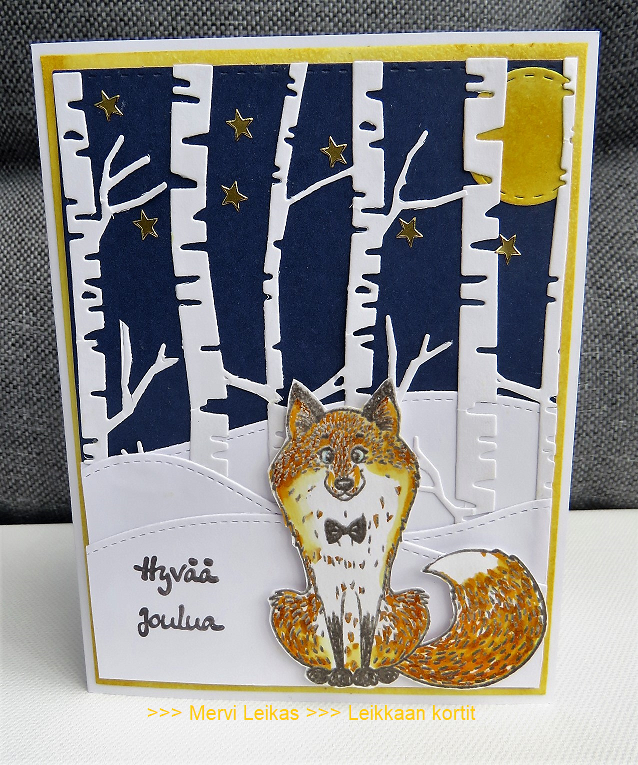 Nicely colored fox and pretty wintery night time scene! This is fab Mervi, and perfect for my theme. This is a perfect card. The fox actually looks like he's cold!!! Beautiful card, I love how you build the scene. Thanks for sharing your creation with us at Creatalicious, we hope to see you back again.